Do it for strength. Do it for health. Do it for fun. Do it for YOU. It’s time for YOU do D.O. it! You’ll learn how to love exercise like you did when you were a kid—no treadmill, no mirror, no music; just sweat and fun. I have led bootcamp classes since 2005. I have learned from my campers that people want a GOOD, TOUGH workout but they also really want to HAVE FUN. I design every workout to make the time fly by and challenge your muscles and cardiovascular system. You will see your cardiovascular capacity increase, your confidence soar, and your balance will improve as you work toward a fitter, stronger, happier and healthier YOU. Why wait? Now’s the time to D.O. it! 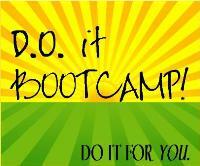 Bootcamp for You.